This week’s Tuesdays with Dorie recipe is supposed to feature raspberries, but berry season is just a fantasy this early in the year, so the ever diligent understudy to fresh berries, dried cherries, stepped in and delivered a delicious performance. I soaked the cherries in ¼ cup Armagnac along with a couple of sprigs of fresh sage, and then enjoyed a showy flambé before layering the cherries in the bottom of the crust. 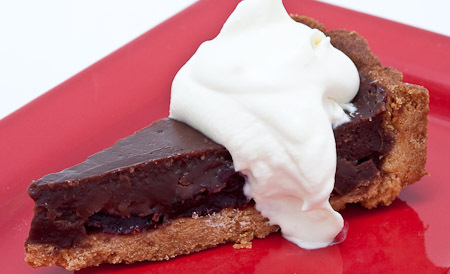 The chocolate custard filling has the texture of pot de crème; rich, velvety and dense. Beautifully satisfying on the tongue and perfectly accented by the shortbread-like crust. The cherries softened and plumped without giving up the nice chewy quality of a dried cherry. As has happened before when baking with Armagnac, the flavor completely disappeared in the finished tart, but it did the job of hydrating the cherries so all was not lost. Next time I will choose a different liquor or use orange juice. I was very excited about the sage infusion, the flavor of which was also nonexistent in the final product. After getting the filling mixed and ready to pour in the shell, I realized my missed opportunity. I should have infused the sage in the cream and butter as it was brought to a simmer. It’s already noted in my book for next time. There is something powerfully appealing to me about the combination of chocolate, cherry and sage. Once again I managed to over whip the cream. I have a slow brain relay when it comes to noticing that the cream looks perfect and actually turning off the mixer. Crumbly looking cream flirting with the idea becoming butter is no way to garnish a dessert. I prepare for the inevidable indiscretion by never pouring all of the cream in the bowl to be whipped. Hand stirring in a bit of liquid cream recreates the lovely billowy softness that existed in the bowl 20 seconds before I generally manage to turn off the mixer. Thank you to Rachelle of Mommy? I’m Hungry! for selecting such a fantastic recipe this week. I’ll be revisiting this one when fresh berries are abundant. You will find the recipe posted on Rachelle’s blog if you are interested in making a really straight forward exceptionally lovely chocolate tart for yourself. Over 350 baking bloggers are baking our way thorough Dorie Greenspan’s book, Baking: From My Home to Yours. 117 recipes completed 104 to go! Tags: cherries, Sage, whipping cream This entry was posted on Tuesday, March 16th, 2010 at 3:32 pm	and is filed under Clever Tips and Tricks, Tuesdays with Dorie. You can follow any responses to this entry through the RSS 2.0 feed. You can leave a response, or trackback from your own site. LOL, oh, that poor overwhipped cream…. looks like how mine ends up. Cherries sound fabulous. I think I would have preffered those over raspberries. I’ve overwhipped my cream so many times, I’ve lost count. I’m surprised I haven’t ended up with butter! Your tart looks and sounds amazing! I have found myself with lumpy whipped cream on several occasions, too. Your tart does look lovely and that sage infusion sounds very interesting. I hope it works out better for you next time. Chocolate,cherries and sage – now I’m intrigued about trying that flavor combination. I’m intending on going the cherry route next time (loved this recipe), and I’m inspired to try your twist. Thanks for the whipped cream tip! I missed this week, but your dried cherry version sounds delicious.